How FUN is this!! 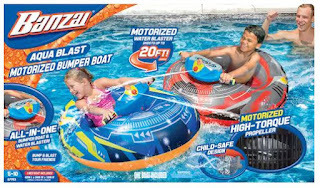 I just snagged Two Sets of these Banzai Aqua Blast Motorized Bumper Boat for $77.98 (Retail $199.98). Kohl's.com is offering 15% off OR 20% off $100 or more with code BIGSAVINGS. 3/22-3/28, Stack with $10 Off Spring Kid's Sale with Purchase of $50 or more with code KIDSALE10 at checkout until 3/31.